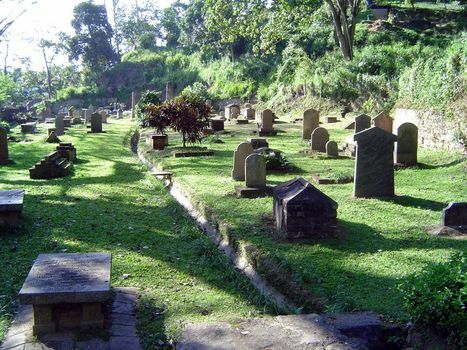 Glimpses of colonials who died in Kandy. 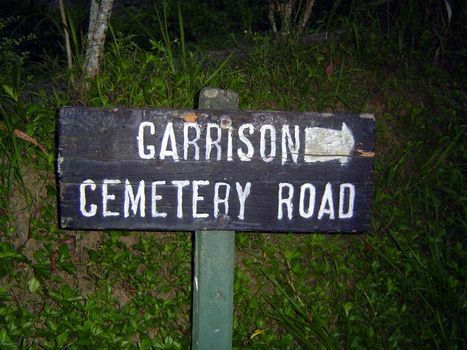 We begin with the Garrison Cemetery, established in 1822. 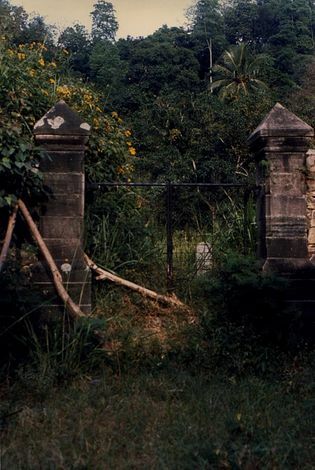 Here it is in 1985, seriously overgrown and the object of an appeal for help to restore it. Twenty years later, it had been cleaned up and was well maintained. Besides clearing the brush, many monuments were rebuilt. A weed whacker was now in use. 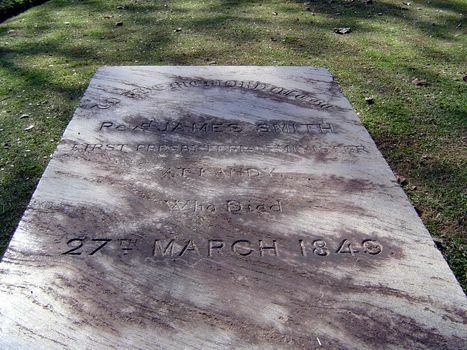 The most important grave in the cemetery belongs to Sir John D'Oyly (1774-1824). 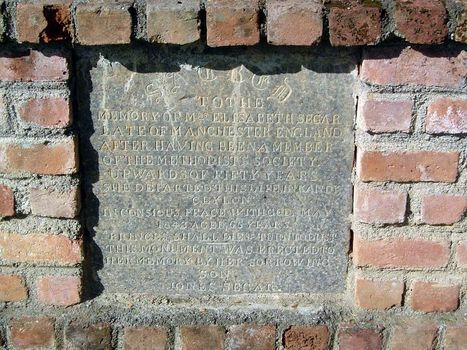 A Cambridge graduate, he went to Sri Lanka in 1801, aged 26. He became a Sinhala scholar.and was appointed chief translator, as well as auditor-general. 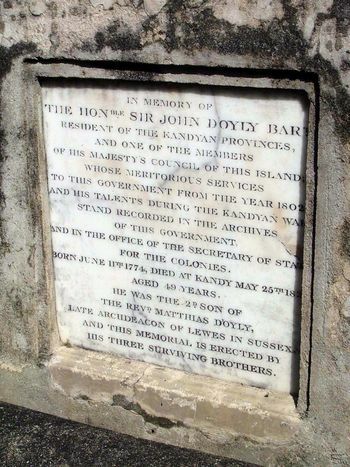 He accompanied the British army to Kandy in 1815 and with the collapse of the monarchy was appointed resident. D'Oyly never returned to England and never married. He was remembered this way: "D'Oyly, you recollect, was one of the party who rowed us in 1799 from Cambridge to Ely. He is the only Cingalese scholar in the Ceylon Civil Service, and like many Orientalists has almost become a native in his habits of life. He lives on a plantain, invites nobody to his house, and does not dine abroad once a year; but he is generally esteemed, and seems an amiable and honourable, though uncouth, recluse. When I saw him come in to dinner at Mr. Wood's, I was struck with the change of a Cambridge boy into a Cingalese hermit, looking as old as I do." D'Oyly published "Sketch of the Constitution of the Kandyan Kingdom" in Transactions of the Royal Asiatic Society, volume 3, part 2. 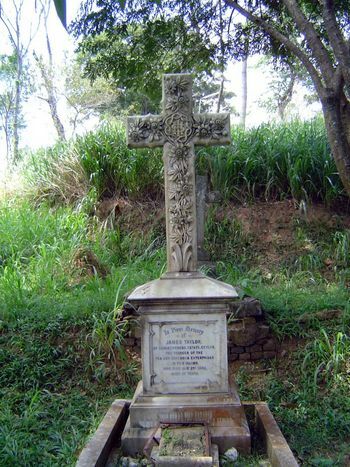 The quotation here, as well as nearly all the details accompanying these pictures, comes from G. Penry Lewis, List of Inscriptions on Tombstones and Monuments in Ceylon... 1913, rept. 1994. 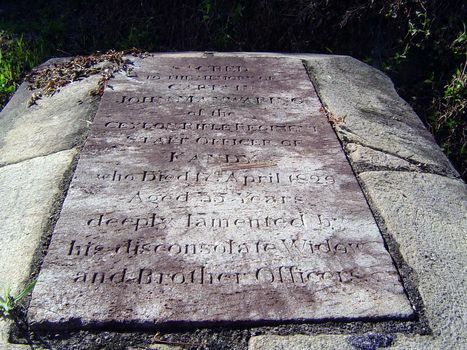 Closeup of the D'Oyly tombstone. 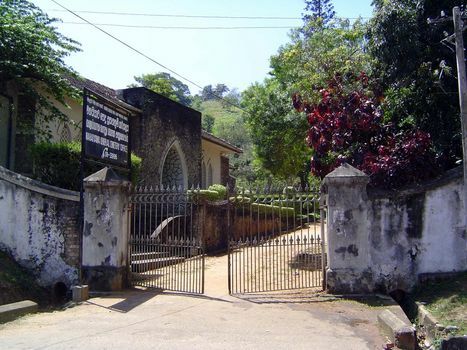 Charles Newton (1824-1867) was employed in the building of the Ceylon Railway and was stationed at Kadugannuwa, at the top of the long climb from the coast to the central highlands. A newspaper obituary reports: "Bishop Claughton went to his house yesterday afternoon to rest on his journey downwards, and found Mr. Newton still conscious, but dying of inflammation of the bowels. So Newton has followed Horne, each a victim to the exposure incident to a great work which they did so much to initiate, but the completion of which neither was destined to see." 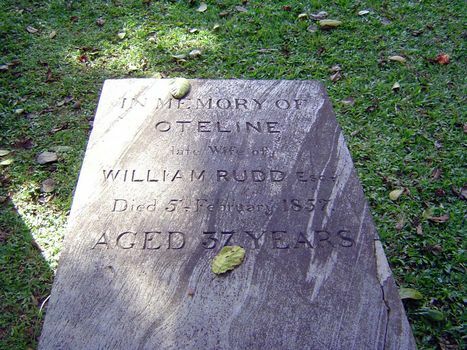 Oteline Rudd (1820-1857) came from a Dutch family that, unlike many others, didn't leave for Batavia when the British took over in Ceylon. Instead, she married Billy Rudd, a Norfolkshire planter. Nothing more is apparently known of her, but Billy Rudd was "a cheery old boy, and always amusing, with a considerable contempt for the amenities of the English language as spoken." He lost his fortune utterly: "Billy Rudd, whose domains, both in India and Ceylon, covered whole mountain ranges and provinces, [was] reduced to utter poverty. I have sat at Billy's board, I have drunk his champagne, and listened to his anecdotes and Latin quotations until my sides ached with laughter... I met him in Kandy after the crash, when he told me with a heavy sigh, but with a manly and cheerful countenance, that they--I suppose his creditors--had not left him with a chair to sit on." Elizabeth Gregory (1830-1873), wife of William Henry Gregory, Governor of Ceylon, 1872-1877. Daughter of Sir William Clay, Baronet, she married James Temple-Bowdoin. After his death, she married Gregory in 1872. 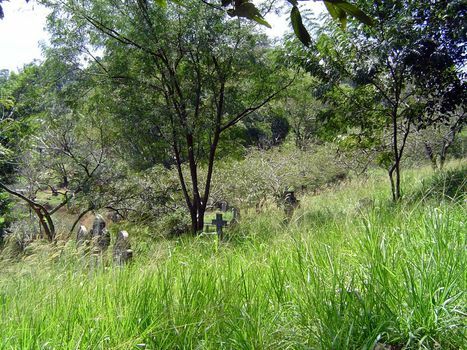 The next year, she traveled to Anuradhapura and fell ill. Gregory wrote, "On my return from my journey I found her suffering from illness brought on by too much exposure to the heat of the sun. After a few days, first of anxious, then of hopeless, watching, she passed away, conscious to the last." 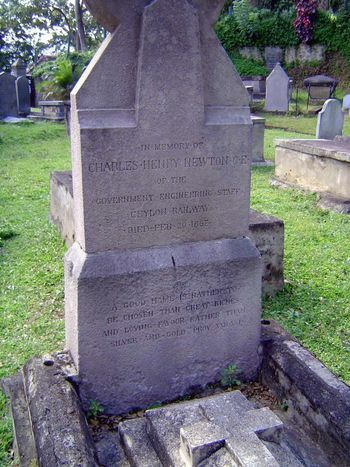 The Reverend James Smith (1802-1849), first Presbyterian minister in Kandy. An obituary describes him as "burning with no indecorous missionary zeal, actuated by no old world scruples against a friendly hand at whist." Smith died six weeks after arriving on the island. 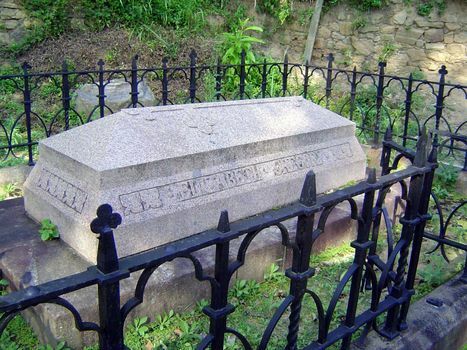 Elizabeth Segar (1777-1843) arrived from Manchester in 1841 as a widow travelling with her grown son. They opened a hotel, the Royal. Two years later she died. John Manwaring (1794-1829) of the Ceylon Rifles. 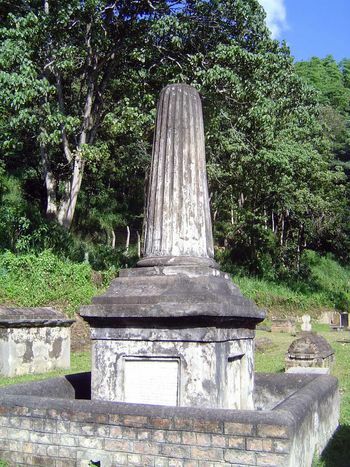 Manwaring served in the Kandyan War of 1815 and was described as "a most efficient officer." Someone else recalled him as "one of the strictest disciplinarians I have ever met with." Lt. Gen. John Fraser (1790-1862). Fraser served with Sir Charles Napier and later took part in the Kandyan War; the Kandyans who faced him in 1818 called him Cheetah Fraser, because of his severity. Among Europeans, he was best known as the builder in 1832-3 of the satinwood bridge at Peradeniya, which lasted until replaced by an iron bridge in 1905. Fraser was also a coffee planter. 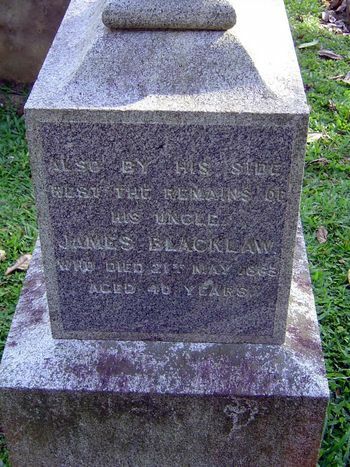 James Blacklaw (1823-63) was one of 14 Ceylon immigrants from the tiny village of St.Laurencekirk, Kincardineshire. Lured by Peter Moir, who had come in 1843, Blacklaw came with his four brothers in search of coffee fortunes. One survived and retired to England in 1907. 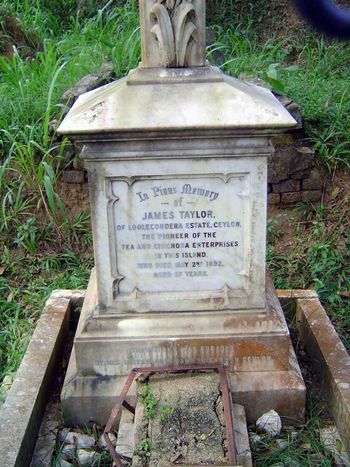 James died on the island. A third moved to Brazil after the Ceylon coffee industry collapsed. The other two disappeared. 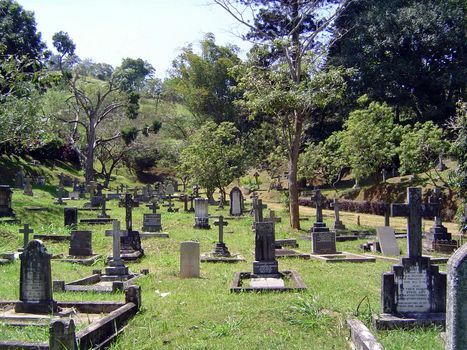 The Garrison Cemetery was eventually closed and replaced by the Mahayaya Cemetery. It is bucolic, though in the city. More than bucolic: it's pastoral in parts, which means you have to watch for snakes. 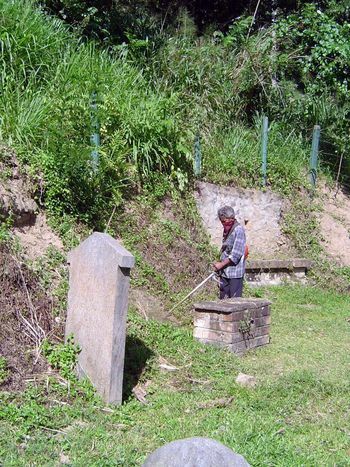 Probably the best known grave at Mahayaya is this one, holding the founder of the Ceylon tea industry. 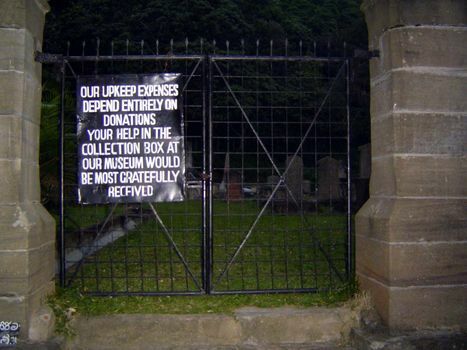 James Taylor, like James Blacklaw in the Garrison Cemetery, came from St. Laurencekerk in Kincardineshire. With the annihilation by disease of Ceylon's coffee industry, Taylor was the first to experiment commercially with tea. The 19 acres he planted in 1868, on an estate owned by others, were still in production in 1908. 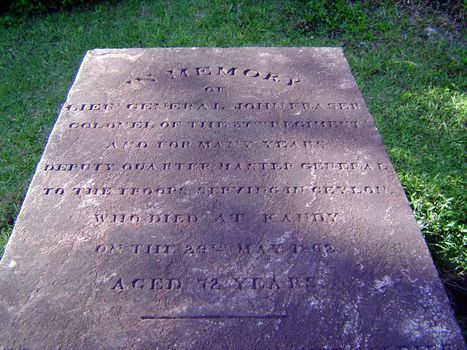 Closeup of the Taylor tombstone.